Learn about storing salt and sugar (and other dry goods) for long-term food storage right here! In the photo at the top of the page, you can see packed Mylar bags filled with vacuum-sealed pouches of bread flour. I've even vacuum-packed yeast that I bought in a larger quantity and re-packed into smaller pouches. Now it's time to go over storing salt and sugar. If you've been a fan of my site for any length of time, I hope you know that I want to make sure that families all across the USA – and the world – have enough food put away, in case the poop hits the fan. So, before I get going with the salt and sugar storage, I want to let you know that we have a new ONE HOUR course out on Udemy that goes into all aspects of storing food for the long-term. You can read much more about that HERE. 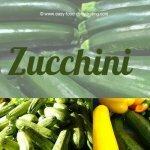 Although this website goes into detail regarding putting away fresh fruits and vegetables, along with cooked meats, I also have canned goods stored away. Many people have written in asking if they can dehydrate canned goods and my usual response is "why go to all that trouble?" because canned goods already last for years "as is." But yes, you can dehydrated canned goods, if you wish. The canned goods I have are canned ham, corned beef, tuna. Also, canned soups. I take advantage of the buy-one get-one free deals at the local grocery store. I have been busy storing salt and sugar - and flour. All you need to do is open up the individual bags, divvy up the contents into vacuum-sealer bags, add a 100cc oxygen absorber, seal the bag, write the date on it and the contents. It's very important to add the oxygen absorber when storing salt and sugar as they tend to soak up moisture! Wrap the packets with cling wrap and store in Mylar bags. (See below for additional info. on Mylar bags). 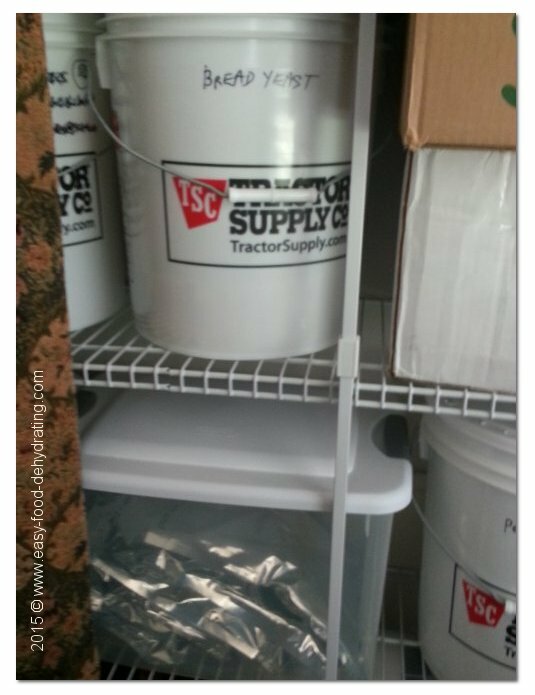 You can also store your filled Mylar bags in buckets (or plastic lidded bins). I have heard positive reviews for Gamma2 lids (see this Amazon link). One reviewer gave a rave review – but I don't think she was storing flour "loose." The same reviewer said to wash the buckets and the Gamma2 lids prior to use; I've no argument with that – but seeing as we're using them to store our Mylar bags, there's no need to go to great lengths in pre-cleaning either the buckets or lids (or plastic lidded bins). The reviewer also stated that these lids were indeed air- and water-tight and that they kept her goodies "bug free." Great for storing flour salt and sugar! What's Needed for Long-term Food Storage? 1. To store flour, or any dried goods such as sugar, and salt is a food vacuum-sealer, and the one I recommend is the FoodSaver™ vacuum sealer machine. 2. Obviously, you'll also need storage vacuum-bags and I highly recommend purchasing them from DC Processing Equipment as their bags are 3 mil. thick. 3. The third item you'll need are 100cc oxygen absorbers. These I purchase from Amazon; sometimes you can buy the Mylar bags with oxygen absorbers as a set – it saves on shipping. Read the reviews to make sure you're buying from a reputable seller on Amazon. 4. Mylar bags are my choice for storing pouches of food – at least 3 or 4 of the plastic wrapped packages can fit in a Mylar bag. But don't over-stuff these Mylar bags as you need to be able to seal the bag. All we do is seal the Mylar bag. If you know you're NOT going to be opening the Mylar bags for at least three- to six-months, then add a 300cc oxygen absorber in the Mylar bag prior to sealing it with the vacuum-sealer "seal" function only. Optionally: my choice for storing all the Mylar bags are plastic lidded bins and buckets. See photo at top of this page with the bread flour in the plastic lidded bin. In the other photo, directly above, you'll see bread yeast stored above the bin on the closet shelving in the air tight buckets. Don't over-pack your vacuum bags as this will only lead to punctures. To aid in the puncturing department, I wrap my vacuum-packed bags with plastic wrap. This takes away the sharp edges of the bags so I can fit 3 or 4 of these bundles into my Mylar bags.